Get the taste of the last section tour of Camino de Santiago. Experience Camino from different perspectives. Hike through Galicia's most fascinating landscapes, from the city of Sarria crossing the green and amazing hills of Galicia until arriving in Santiago de Compostela. The Camino de Santiago was declared the first European Cultural Itinerary by the Council of Europe in 1987 as well as a UNESCO World Heritage Site. You will be provided with various accommodation option for the duration of five days at different destination stops. The type of accommodations will vary between three to four-star hotels, country manors, and / or B&B. The rooms will be double rooms with private bathrooms, comfort, and a great location. Additional charges for individual occupancy will apply. You will start your Camino journey in Sarria which will allow you to walk the last 115 kilometers of the French Way to Santiago de Compostela, earning your pilgrim certificate, “The Compostela". You will have the chance to dine and rest at carefully picked out restaurants and hotels through this tour. The tour guides will happily share their advice and experience to enhance and smooth your journey. This tour will take place in several locations from Sarria, through Portomarín, Palas de Rei, Arzúa, Arca (O Pino), and finally Santiago de Compostela. Daily breakfast, two dinners for the first and last night are included in this tour. Snacks and water during the journey when possible will be provided. Please book your flight to arrive at Juan Santiago de Compostela Airport (SCQ). Transfer from and to this airport is available upon request. The airport is 120 kilometer from your departure point in Sarria. The fastest way is to take a combination of two buses: from Juan Santiago de Compostela Airport (SCQ) to Lugo bus station and then a local bus from Lugo bus station to Sarria bus station. Once a day, there is also a direct bus between Santiago de Compostela bus station and Sarria bus station, except for Saturdays and Sundays. Please book your flight to arrive at A Coruna Airport (LCG). Transfer from and to this airport is available upon request. The airport is 123 kilometers to your departure point in Sarria. There is a bus from the airport to A Coruna train station. Then there is a direct train from A Coruna train station to Sarria. Please book your flight to arrive at Vigo Airport (VGO). Transfer from and to this airport is available upon request. This airport is 180 kilometer from your departure point in Sarria. You can travel from Vigo to Santiago by train. Please book your flight to arrive at Madrid Airport (MAD). This airport is 487 kilometer from your departure point in Sarria. To travel to Sarria you should take a train from Madrid Airport (MAD) at Terminal four to Madrid-Chamartin train station and then the night train from Madrid-Chamartin to Sarria. Airport: A Coruña Airport Airport transfer available: A Coruña Airport Additional charges may apply. You can request this in the next step. Airport: Adolfo Suárez Madrid–Barajas Airport Airport transfer available: Adolfo Suárez Madrid–Barajas Airport Additional charges may apply. You can request this in the next step. Airport: Santiago de Compostela Airport Airport transfer available: Santiago de Compostela Airport Additional charges may apply. You can request this in the next step. Airport: Vigo–Peinador Airport Airport transfer available: Vigo–Peinador Airport Additional charges may apply. You can request this in the next step. 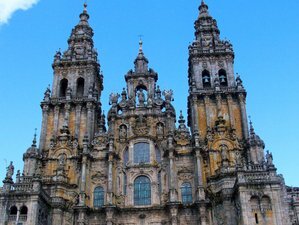 Your Way To Santiago has many years of experience in guiding pilgrims on the Camino. They are experts in its different routes and walking journeys.